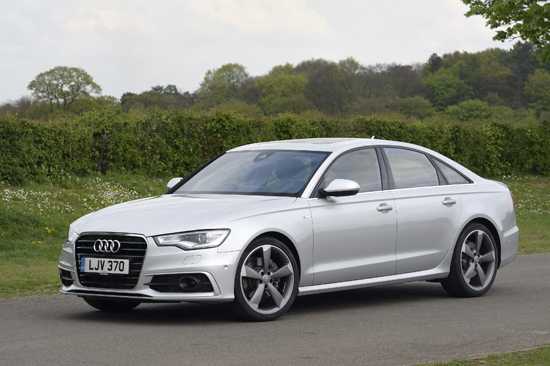 Tom Scanlan road tests the refined, sophisticated Audi A6 Ultra diesel. The end result of all the experience Audi has gained on the race-track with their unrivalled success over fifteen years at Le Mans is proof of the worth of motorsport. The A6 Ultra is probably the quietest four-cylinder diesel car I’ve driven, and perhaps six-cylinder cars could be included in that. The engine is the latest development of Audi’s twin-cam direct injection turbocharged unit. It produces 190 PS, enough to propel the car up from 0 to 62 mph in just 8.2 seconds. This comes via a 7-speed dual clutch automatic gearbox that gives fast, almost seamless changes. There are the usual options of changing manually via paddles on the steering wheel or the selector lever itself. On autobahns in Germany the car was taken to around 115mph (its maximum is 144 mph) and thanks to 400Nm of torque, acceleration hardly fell away up to that point so that the car felt completely unstressed. On UK motorways, 70 mph feels almost slow. There is also no appreciable wind-noise at any speed. Considering the available performance, the fuel consumption puts a smile on your face. Starting with a full tank and filling to the brim after 600 miles, the figure was 50 mpg (the car’s trip computer showed 53 mpg, by the way); Audis useful lightweight materials and the car’s good aerodynamics undoubtedly contributed to this impressive return. If the car is used much more on the shorter trips or in town traffic, then consumption is likely to be anything from 35 to 45 mpg. The steering is precise and nicely weighted: for manoeuvring; it’s light and easy; at speed along zig-zagging cross-country routes, it gives the driver just the right amount of feel through resistance. The A6 Ultra handles beautifully with no lean or pitch or yaw. It hardly needs adding that the brakes are excellent; depending on what you’re used to in the feel of a car’s brakes, the A6’s may seem very sensitive at first, but you soon adapt. The car stops powerfully and smoothly in an emergency (just the usual slight judder as the ABS cuts in). The Audi can be set to be driven in varying modes: comfort, auto, dynamic, eco. Most of my mileage was in auto mode, but using the eco-mode could well be the thing to do if the car’s full acceleration capability is not needed: there is still power enough for general driving situations. The ride is comfortable. It seemed a bit strange to have manual seat adjustment in a car of this class (electrics are an optional extra), and the knob for the backrest adjustment was rather stiff. However, there is electric control for lumbar support. The interior is to the usual Audi high standard, both in design ergonomics and quality. It’s a very nice place to be! In the back there is a good space for two adults. The boot is very good with loads of space, with an emergency SpaceSaver spare wheel underneath. Unusually for Audi, the test car had only about £2500 worth of options the main one being the technology package that includes SatNav, costing £1500. Audi’s satellite navigation is one of the more intuitive and user-friendly ones, easy to switch off the voice guidance; however, when the screen gives you a choice of three routes to get to the more distant destinations, a very fast finger indeed is required to make your decision. 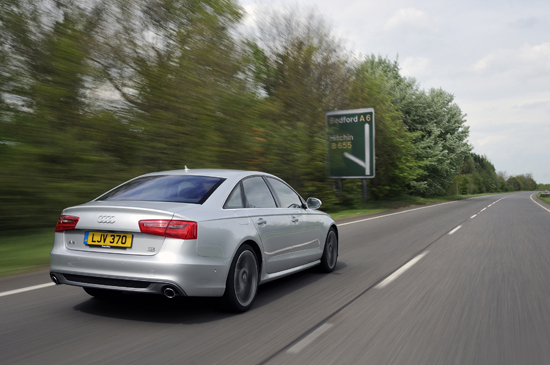 The car test car, the 2.0 TD S line ultra S Tronic costs a basic £33,720. Total with delivery and options £36,820. You’re paying for fine car. And, latest news, Audi has just announced a revised version of the A6, including new looks, starting at around £32,000, so you could well get yourself a really good deal on buying one of these outgoing A6 Ultras!